The nights have gone cool, and who can complain at this point in the year? While I confess that the climate in mid-Maryland often leaves something to be desired, a nice fall here really can’t be beat. Our nights are cool, and days are dry with clear blue skies. Perfect time to get the last few harvests of summer veggies. I’ve gotten the last of the tomatoes, the cukes are dwindling, my butternut squash are hanging on the vine getting a nice protective skin, and I thought the zucchini were done. Then I lifted a few of those gigantic leaves. What I had assumed was the wooden border of the garden was actually a huge and very dark zucchini. I mean HUGE. And two days later – another on a plant that I thought had given up earlier in the summer, but was growing in secret behind another plant. So now I have these enormous zukes. My favorite trick with zucchini is to shred it and freeze it. I tend to do it by weight, put it in a bag, write the weight on the bag and pop in the freezer. Why by weight? Because my favorite zucchini bread recipe calls for zucchini by weight. So as we move into the cold months, I have my key ingredient already shredded and measured, ready to go. My favorite zucchini bread recipe is based on one I used for years from The America’s Test Kitchen Family Cookbook. America’s Test Kitchen publications, such as The America’s Test Kitchen New Family Cookbook (this is the new version of the book I have which is no longer in print), are fantastic. 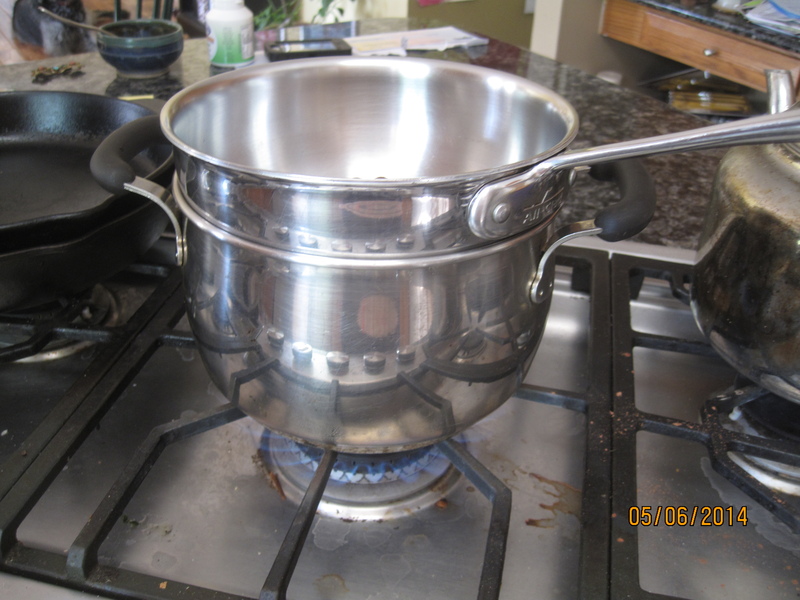 If you are trying to improve your cooking skills, there are few more comprehensive resources. The recipes are not intended for restrictive diets, but they are full of real food and I’ve successfully adapted many of them as my own dietary preferences have changed. And what I’ve learned from the authors has been priceless. This zucchini bread is lightly spiced, sweet but not cloying, and deeply satisfying with a cup of coffee, or a mug of tea, or whatever you want to drink. Preheat oven to 375 with rack set in middle of oven. Coat a small loaf pan (mine was 8 x 4, standard is fine, but your loaf will be shorter). Shred zucchini on large holes (I used a food processor)l Place zucchini in strainer. Sprinkle with a little salt and stir to distribute the salt. The salt will pull the liquid out of the veg. Let drain for at least 15 minutes. Wrap a tea towel (or paper if that’s all ya got) around the zucchini and squeeze the remaining water out. Be astonished by the amount of water in that veg. No, you can’t skip that step. Whisk coconut milk, maple syrup, applesauce, coconut oil, flax eggs and lemon juice together in a bowl. Whisk dry ingredients in a large bowl. Fold the zucchini and the wet ingredients into the dry ingredients until just combined. Do not over mix (yeah, I don’t know why either). 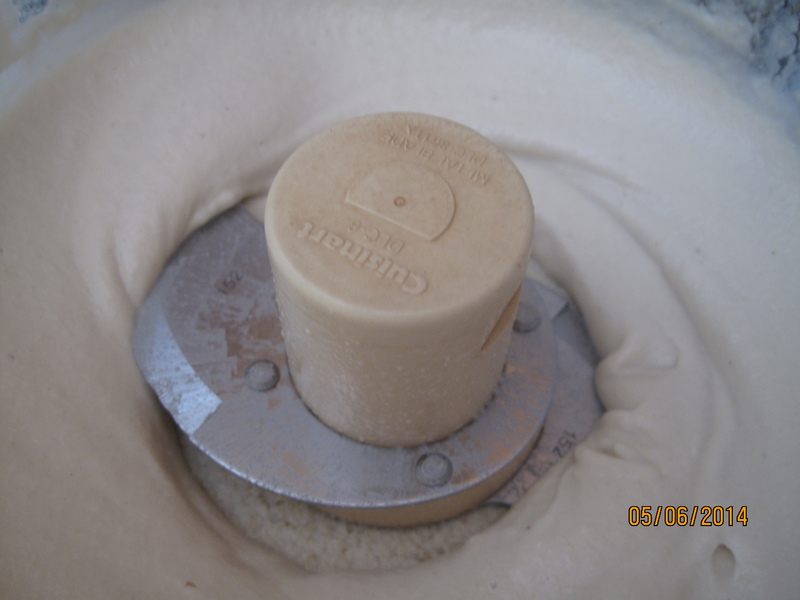 Scrape batter into loaf pan. Bake until golden brown and toothpick comes out clean – or until it feels right to you (that’s my test, a little press in the middle with my finger), should be about an hour. Let cool in pan for 10 minutes. Continue cooling on wire rack for at least an hour, being sure to have a taste while it’s still warm. Super yum. The season of birthdays has begun here in Mid-Maryland. For whatever reason a good portion of my family was born in the spring and summer and once the parade of birthdays begins, it doesn’t slow down until September. Friends, that’s a lot cake. I do love to celebrate and Mr. Little Sis LOVES cake, so despite my lack of enthusiasm for it (more of a pie gal honestly) I decided to honor his birthday with his favorite variety, a serious chocolate cake. While I’ve baked a lot, I don’t consider myself an authority on dairy free baking, particularly when it’s not for bite sized bits for lunch boxes. I decided to turn to a friend with more experience, and as usual the search for assistance bore delicious fruit. Big Sis introduced you to our friend Somer (if you didn’t already know her, that is) with her Cheddar Cheesy Cashew Spread and I turned back to that same fabulous vegan cook for a little cake help. 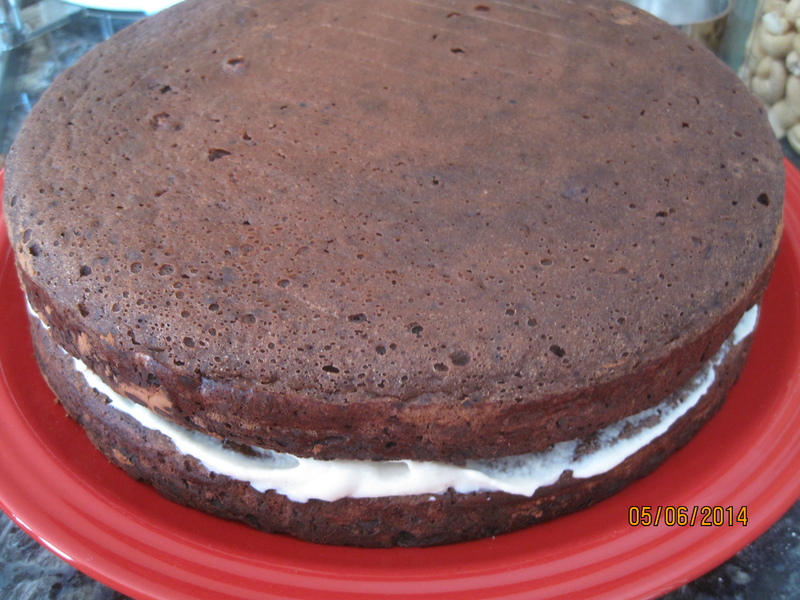 Somer delivered with her Insane Chocolate Layer Cake, a low fat, whole grain decidedly chocolate cake. I made just a couple of changes to make it work better for my family and it was a lovely and actually quite sane chocolate treat. I swapped maple syrup for Somer’s agave and cut it to 3/4 c. Readers who are not accustomed to less sweet treats or who are new to healthier baking should use the full cup. I also cut the apple cider vinegar to 2 T. because I cut the sweet I thought it was important to cut the sour zip to maintain balance. 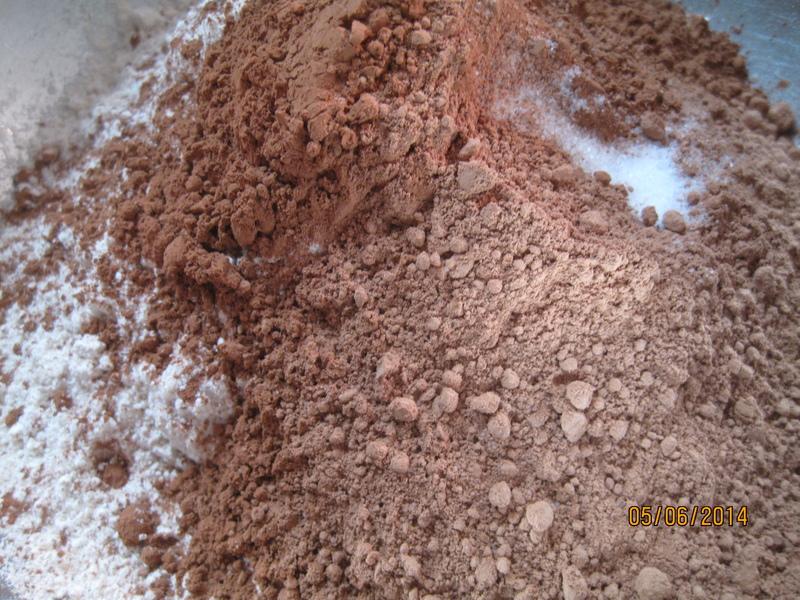 I also used only a little raw cacao and mostly used regular cocoa powder. 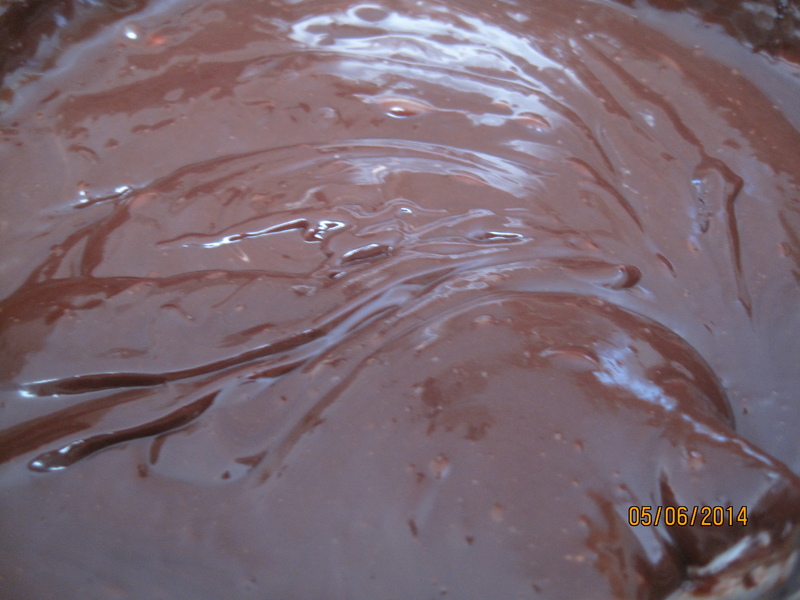 I find that if I use too much raw cacao, nobody around here sleeps, and I’ll just admit it that one of the reasons I am the sane Mom that I am is that at the end of the day, people go to sleep. 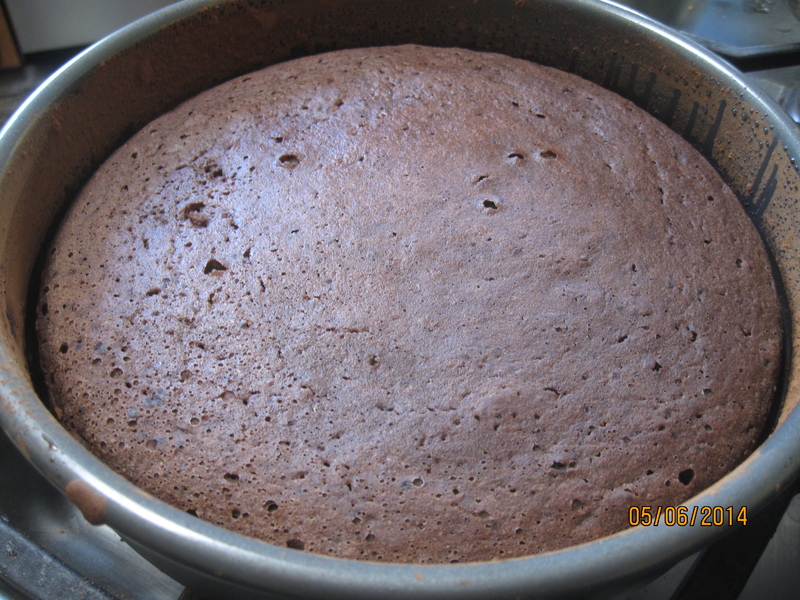 The cake baked up just as Somer indicated that it would, although when I make it again, I will use 8 inch pans rather than 9 inch. It rose, but the layers were not as lofty as I wanted them to be visually. 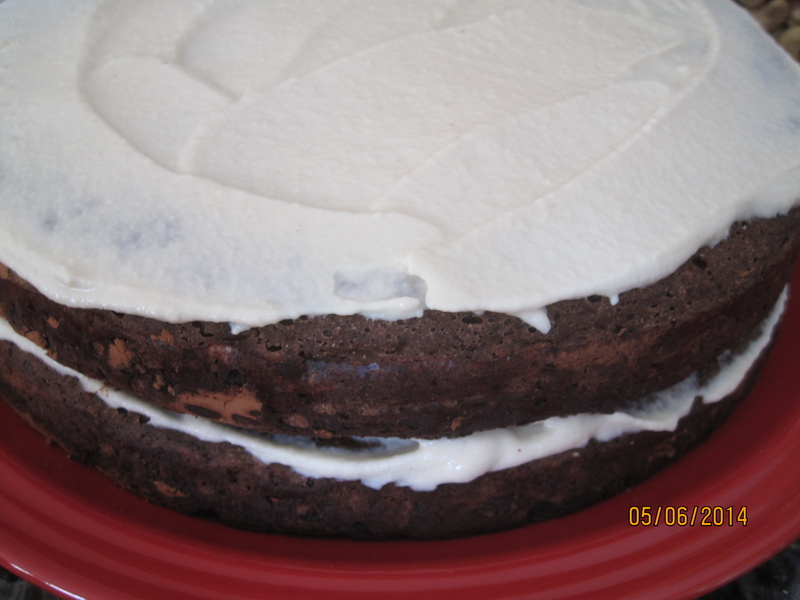 For layering and topping our cake I used a cashew cream and a chocolate ganache. Concensus at the table, particularly amongst the younger crowd, was that I should have used less nut cream and more chocolate. It is important to note that my crew would pretty much always call for more chocolate. Place all ingredients in food processor and blend until creamy. Yes, that’s it. 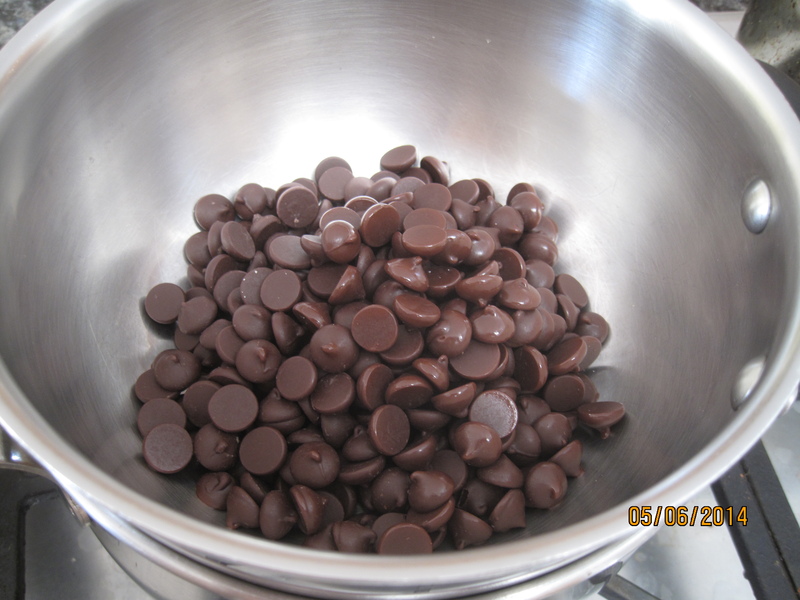 Place chocolate chips in the top of a double boiler (or stacked pots) with water in the bottom heat on medium high. Keep an eye on the chips as they melt, stirring occasionally. They hold their shape even when they are essentially melted. When the chips are melty enough to stir, remove from heat and stir in the coconut cream. 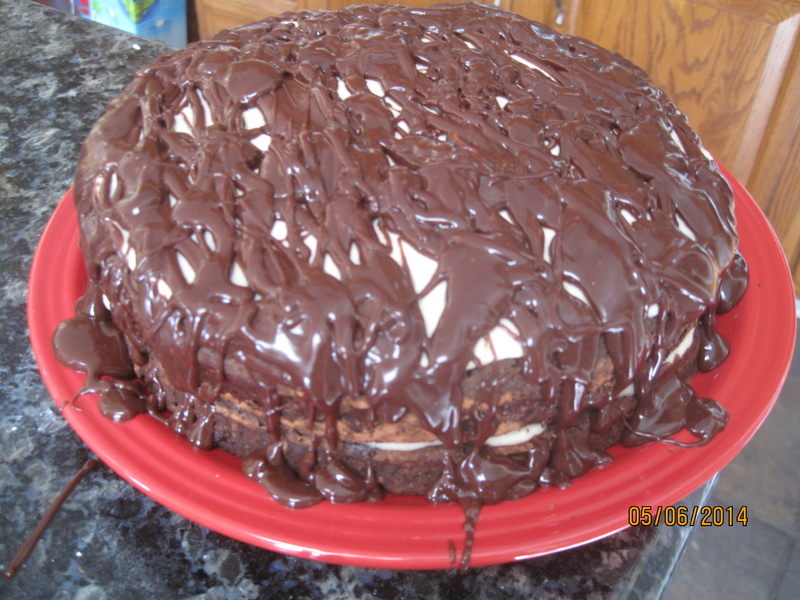 What you do at this point depends on how you want to use the gananche/frosting. 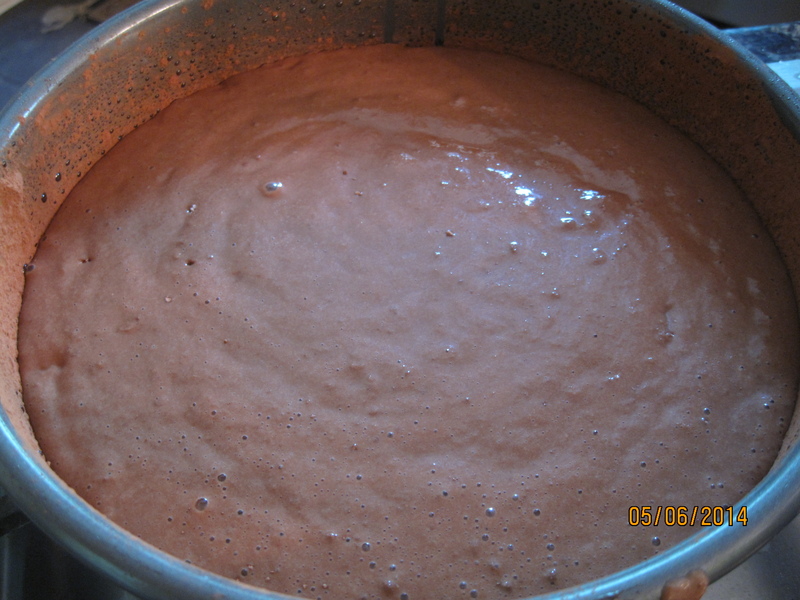 If you want to frost the cake in a more conventional way, you should chill it for at least 20 minutes. 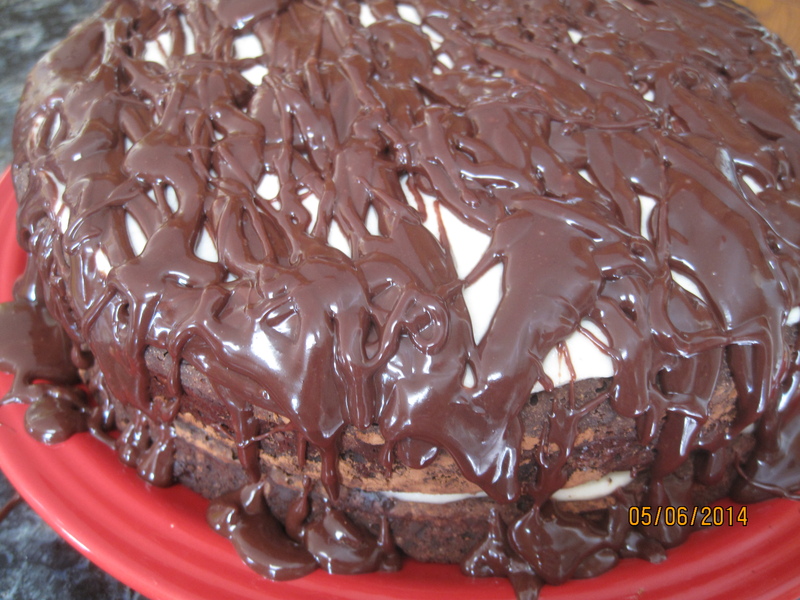 If you wish to drizzle, as I have, drizzle away immediately and then place the cake in the refrigerator so the chocolate can set up a bit. Wow that’s chocolate-y. And oh so very delish. Happy Birthday Mr. Little Sis.